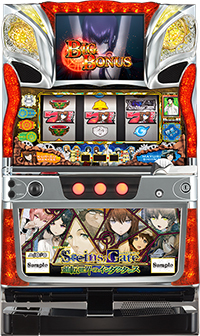 The latest pachislot machine of “STEINS;GATE”, which we have introduced its prior machine on September 2015, is now making its debut!! 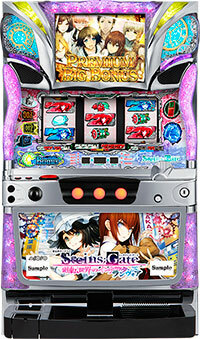 Just like its previous series, this machine also follows the worldview of its original work. However, this machine is loaded with a new system called “Replay Time”. Thanks to this new system, player can play without spending any medals so that players can play this machine for a long time!! Plot of this story is the Akihabara and lots of attractive characters flourish in this sacred place for Japanese anime culture. Let’s give “STEINS;GATE” a chance to play! Today, we will be introducing a pachislot machine of “STEINS; GATE”, a popular game that has been made into an anime in 2011, and recently, a release announcement of its next work “STEINS; GATE ZERO” has been made!! This machine sets its stage in Akihabara, and the story revolves around a time leap machine that was created accidentally, to change the past comrades want to change. Also, this machine is loaded with a whole new characters’ ending, created by the staffs of original work, that fans of the original work will sure to be impressed as well!! Time leap feature is also added to the game elements. Story continues by hitting a jackpot few games after the prior jackpot!! It is expected to make its debut in November.Don’t miss it! !